Since it's completion a couple of years ago, I've received multiple questions about my Pixelated Color Wheel. Readers have asked me to write a pattern, others a tutorial or QAL series. The reality is that a project like this is far to challenging to write into a pattern. I used 200+ solids in this small, 45" quilt. Also I love this quilt too much. It's become quite iconic of my work. I honestly wouldn't want a lot of people duplicating is exactly by providing a pattern. I'm a little possessive of this piece. Pixel quilts are all over. There are some amazing ones I've seen on Flickr. I personally love designing with small squares. I am constantly amazed at the patterns that can be developed from arranging these tiny squares precisely. One of my favorite pieces of art has always been A Sunday Afternoon on the Island of La Grande Jatte by George Seurat. When I was 12, I was able to see it in the museum while visiting my aunt's family. I really have no idea why, as a 12-year-old kid from a rural town, I was so in love with this painting, but I was. I was so excited when I learned it was at the museum. I bought a poster from the museum gift shop which I hung in my room, even through college. I admit to knowing very little about art/art history. I just think this is an interesting, unique painting. What I love most about it is Seurat's technique of Pointillism. I love that this work is made of dots. Perhaps my love of this painting has led to my desire to create quilts from tiny squares. A friend has told me several times, I have a sickness--particularly when I talk about even more projects with small squares. I have officially started a new pixel quilt. This time I'm using 1.5" squares (1" finished). It probably is a sickness. Rather than hosting a QAL series, I plan to document my creative process in a series of posts here on the blog. I think pixel quilts lend themselves to a lot of creativity. The design is completely up to you. There are no pre-designed blocks to determine the outcome. 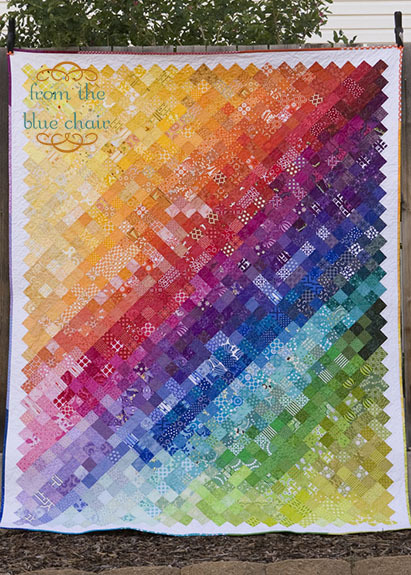 You could place the squares on point as in my Color Quilt. You could choose to make the squares a touch larger. These are 2" finished. You could use solids or prints. You could design your quilt free-hand as I did or use an image converted to a pattern (I've never done this, but there are some very cool ones out there). There are so many options to making your pixel quilt unique. Inspiration can be found anywhere. If you are considering doing a pixel quilt, start looking for ideas. I'm not talking about in other quilts. Look at photographs, your surroundings, nature, etc. Look at color and placement. Get ideas from your life. My brain started working on the idea of a new pixel quilt when I came across this photo on Pinterest. I love this image and knew it needed to become a quilt. 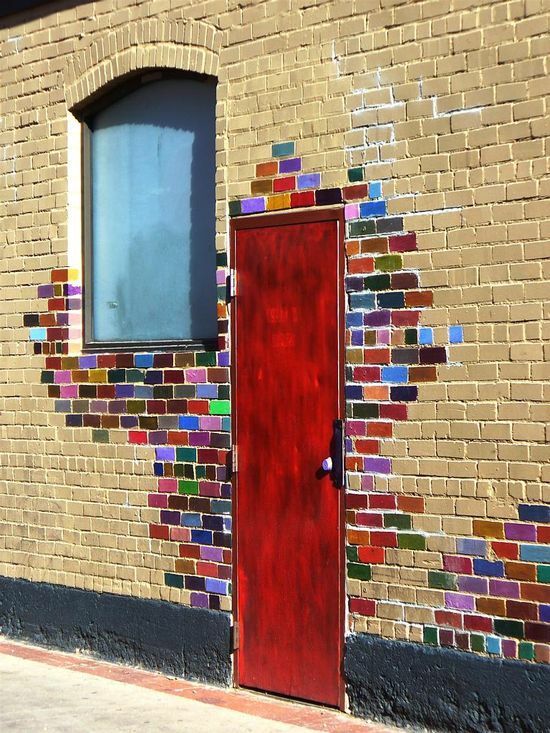 For me there was something very fun about the bright colored bricks against the neutral background. My quilt will look nothing like this image when I'm done, but it was a perfect starting point. After thinking this project through for quite a while, I translated that image into a quilt idea. Most of my quilt ideas don't happen overnight. I honestly think about it for months. I created a rough design in Photoshop. 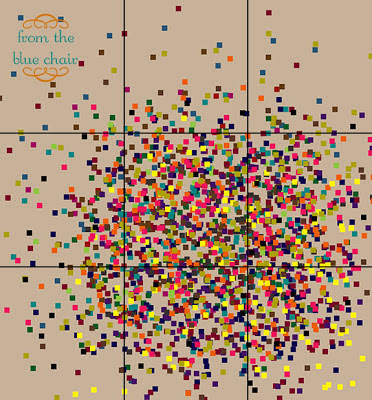 This is not a pattern, but simply a sketch to remind me of color placement as I create the blocks. 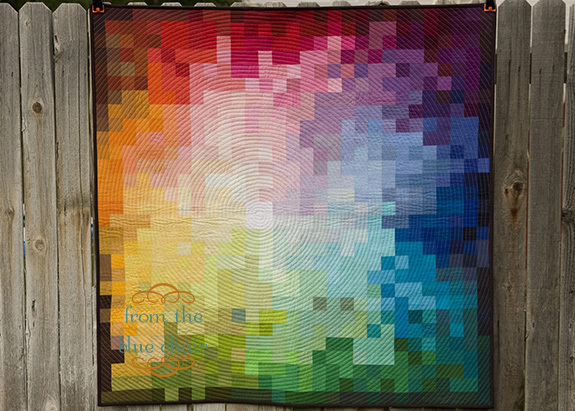 I wanted the majority of the color to fall in the lower right of the quilt. I originally planned to make (9) 12-in blocks. I have created two blocks so far, and plans have changed. I'll share more about that as I continue to write posts about this project. I'm excited to share this process with you. I'm setting no schedule for myself. I have no deadline. This project might take me a year, but it will be fun to document as I go. Please let me know if you have specific questions about pixel quilts, and I'll try to answer those in future posts. I will not be discussing creating a pattern from an image or design. I don't do pixel quilts from patterns. I learned this the hard way when sewing my Tokyo Subway Quilt. That is not a project I remember too fondly. For me it's about arranging and rearranging those tiny square until I like the outcome. I know this type of design is hard for some people, but it's my favorite part of the process. That's why I'm choosing to share my full process on this particular project. I enjoy learning about someone's creative process because it helps me in my own. If you've considered doing a pixel project, don't feel as though you have to make a quilt. I'll also be sharing a tutorial in a month or so for Pellon Projects. We'll just make a simple pixelated pillow together. Great post! Your pixel quilts are so beautiful, and part of that beauty is their uniqueness. I'm kind of glad you're not making patterns for them - it's nice to see things that are completely one-off. I think we could all do with trying for a bit more originality (or at least I could!). Based on your inspiration image and sketch, I can't wait to see your next pixel quilt! I love both of your pixelated quilts. I'm in the stage of collecting scraps. I'm not sure if I'll make squares or hexies but it'll be just mini quilt for the wall. I do like the process of rearanging fabrics, colors so I wouldn't really fancy a pattern for these. I rather do it my way but thank you so much for inspiration. This is going to be awesome. I'm excited to see what you do with this. I've got a pixelated quilt in mind, and have for a while, but it's going to be a long time until I'm ready for it. Wonderful pixel inspiration above! 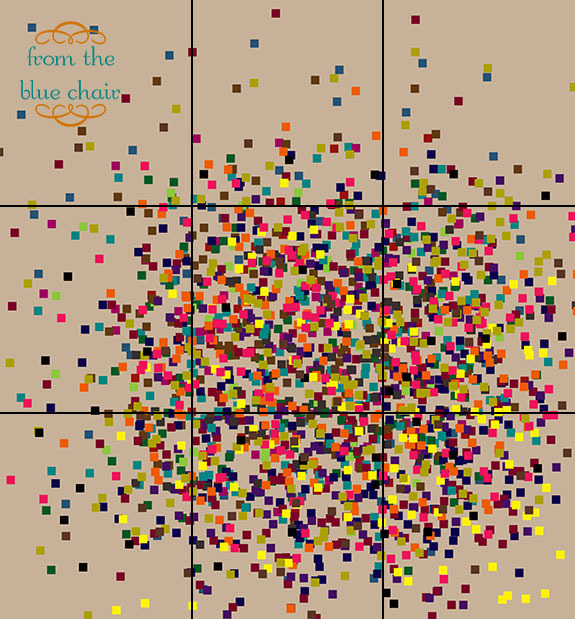 Did you know Emily Cier has a pixel pattern for the George Seurat painting here. I love your pixel quilts, but I think it's safe to say I'll never replicate them, I so do not have the patience for all those wee squares! I love the pixelated look and have played with it a bit with hsts, so triangle pixelated and I want to do more. I love how the colours and their changes just keep you interested in the simple patchwork for so long. Thank you for sharing your process. My only question about making a pixelated quilt is how do you keep your seams straight when sewing so many small rows? I don't think anyone could blame you for being possessive of that beautiful quilt! I love this new design you are working on, I think it would be beautiful to make with lots of bright scraps. I saw that painting a few years ago - it was amazing. Even now I sit here in awe thinking about how complex the painting was. (and big!) My husband and I even looked for a print in the gift shop to frame - but we couldn't find any! It's amazing how art (even when we're clueless) can speak to us. These are amazing, thanks so much for sharing them. I do have a question, if you don't mind sharing. Was it difficult to do the circular quilting that you had on the first piece? Any tips for how to start that on a quilt? Thanks again!